Home  My Gleanings Page  Illustrated Issue - Page 3. Illustrated Issue - Page 3.
finally assumed the task himself and entered upon the work with well directed enthusiasm and a determination to solve the problem if skill and money would accomplish it. Specially constructed machinery for this purpose adapted to meet the requirements has been tested and approved and will be installed as early as it can reach the property. This will make the Cullen a large producer and shipper of ores. 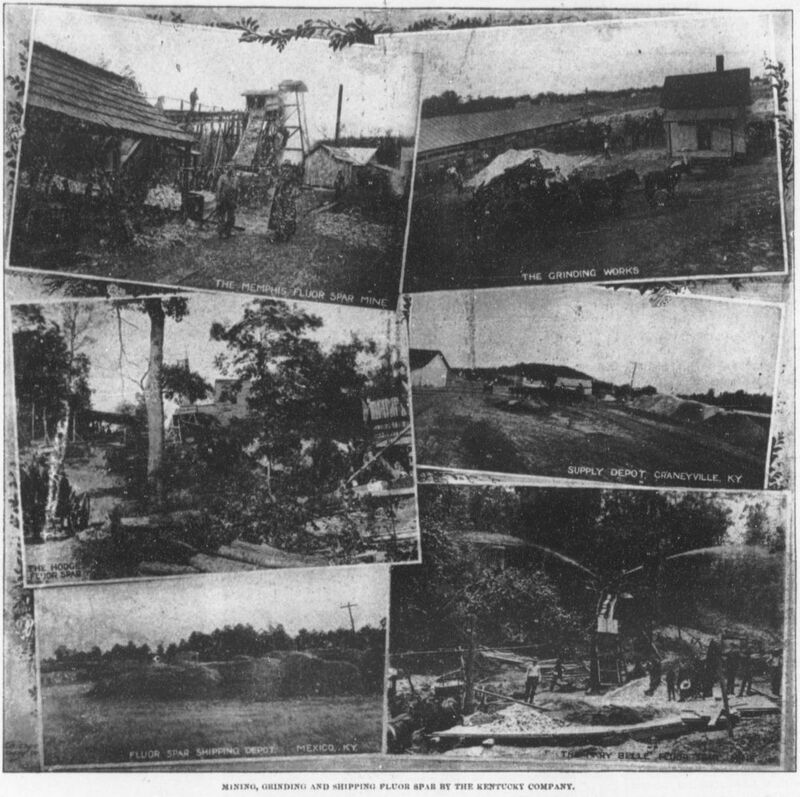 The Eagle company mine and ship fluor spar from their property near Mexico, on the Illinois Central railroad, and have also large holdings of mineral land in various portions of the district. IN THE FLUOR SPAR MINES. 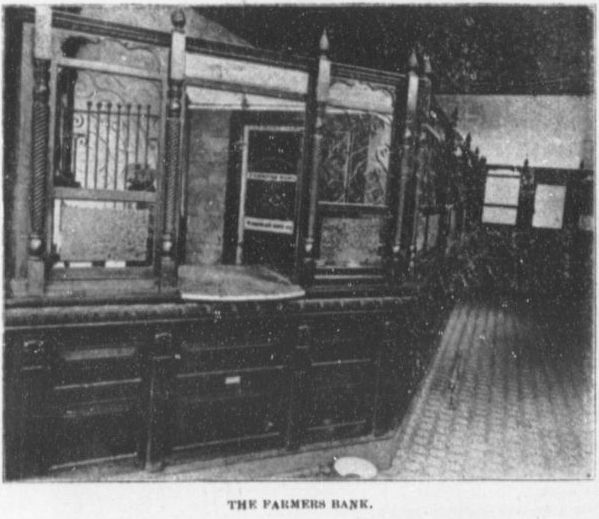 Interior of the Bank Buildings. The American Lead, Zinc and Fluor Spar Company. The Bonanza mine, near Lola and the Morning Star mine, within a short distance of Salem, are the properties upon which active work is being done by the American Lead, Zinc and Fluorspar company, whose home offices are in Cleveland, Ohio. Mr. Arthur J. Morton, the resident General Manager, whose experience in mining has been varied, cites as a remarkable fact that the water pumped from the Bonanza mine carries nearly 3 per cent of sulphate of zinc. The indications from such a rare occurrence point of course to a large body of zinc sulphides in the near vicinity of the already deep workings. the bonanza fluor spar is noted in the markets for its high grade "calcium fluoride," and its freedom from all ores of either zinc or lead. the Morning Star mine carries fluor spar and lead ores, and is finely situated for a large production of these two minerals. In addition to the two mines mentioned, the company own some 450 acres of developed and partially developed mineral lands. The Largest Miners and Shippers of Fluor Spar. The Hodge Mine, owned by the Kentucky Fluor Spar company, is a treasure house of fluor spar. A magnificent breast of mineral, 20 feet wide, is at the 100 foot level, while above and below this wonderful article fills in between the walls. Steam hoists, washers and all the perfected mining machinery is in use at this and the other properties of the company. The Memphis mine, owned by the same company, is another property that has produced thousands of tons of the bright, sparkling substance that the glass factories clamor for. the Memphis and the Hodge mine product being almost absolutely white and of high grade is ground and shipped to the glassworks of the country and the hydro-flouric [hydro-fluoric] acid manufacturers. Another property that is a wonderful producer is the "Yandell." Seemingly the entire surface of the Yandell property is taken up with fluor spar. A great deal of kidney galena is also found in the Yandell spar but as it is easily noticeable it is assorted and retained for the lead smelter. The Yandell, in connection with the Tabb, and what are known as the Blue & Marble lands are situated near Mexico and their product is delivered to the railroad station of that name for shipment. The scenes at Crayneville and Mexico illustrate the extensive business transacted by the Kentucky Company. The figures given by the railroad authorities in another section of this issue of the increase of some ten million pounds from the previous year of the shipments of fluor spar by this company indicate far better its tremendous business than any words could do. Owned and Operated by The National Zinc, Lead and Spar Co. The National Lead, Zinc and Fluorspar company, of Cleveland, Ohio, have recently completed a concentrating plant that will crush and jig or separate 100 tons daily of the ore from the rock. This mill is of the Joplin type, and is located right over the mining shaft, which will make the handling easy and cheap. The mill at the latest accounts was about ready to make its initial run. The ore carries galena, zinc blende, fluor spar and calcite. Earl & Trout, 1017 Rose Building, Cleveland, Ohio, represent the company. A shaft of some 100 feet in depth, sunk on a fluor spar vein within a few rods of the Marion station on the Illinois Central railroad, constitute what is known as the Bigham mine. Slight quantities of zinc blende and galena have been noticed in and among the fluor spar. These ores are not in sufficient quantities to furnish much more than an indication that they exist in the vein somewhere. This property is located on that is known as the Marion Break and has shipped some fluor spar. Harth Bros. & Finley are the proprietors. The Nancy Hanks Mine, Near Salem. 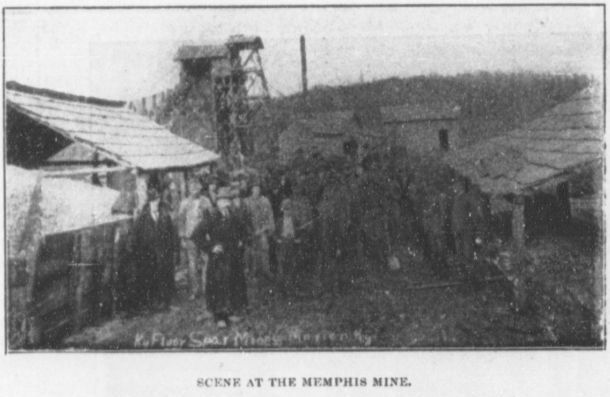 The Nancy Hanks mine is operated by the Muncie Mining and investment company, of Muncie, Ind. It is said to carry galena and fluor spar. 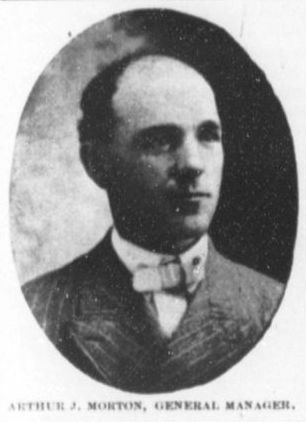 Mr. E. L. Lewis, of Albany, Ind., is the representative of the company. 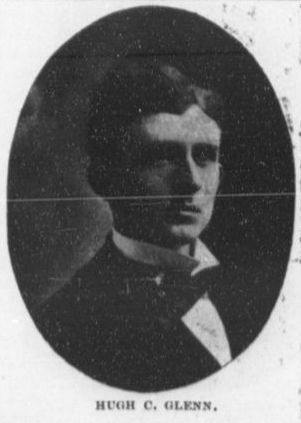 His address is Salem, Ky.
Nearly 30,000,000 pounds of fluor spar have been delivered to and shipped from the Crayneville station on the Illinois Central railroad during the last three years. 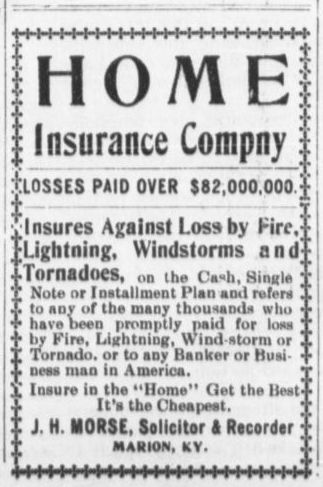 Mr. Glenn, the agent of the company and the proprietor of the mercantile firm of Glenn & Deboe, carries a $6,000 stock of goods. He is also postmaster and the agent for the Kentucky Fluorspar company. He is most ably assisted by Mr. J. F. Dorroh, who for the past ten years has been connected with the business in the capacity of chief clerk and assistant postmaster. Mr. Cleve Wolfe and Mr. J. N. Jacobs have, under Mr. Glenn's direction, the charge of a large force of men and teams employed in handling the immense tonnage of fluor spar. Mr. Glenn has a lovely home near his place of business, a charming wife, who was Miss Rosa Woolf, of Livingston county, and a lovely little daughter of four years, Miss Ethel Margurite. A typical English miner, his makeup can be seen in one or two of the etchings illustrating the works of the Kentucky Fluor Spar Company, of which he is the general superintendent of mining. Mr. Watkins is on e of the pioneers in this district so far as mining goes and is probably the best posted man on minerals and veins that we have with us. Always on the move, careful and considerate with his 300 or 400 employe[e]s in the mining field, of perfect physique and good judgment views in regard to values of mineral lands are constantly sought by both owners and investors in our district, and when obtained are promptly acted upon. Mr. Watkins has recently secured a large interest in one of our most developed mines, and with his usual push and vim will quickly place this property in the front rank of producing propositions. The Drummers Home at Smithland is noted for its early and late meals. In fact a tired and hungry traveler is always made welcome and a special dinner or supper served, no matter what the hour. Source: Crittenden Press. 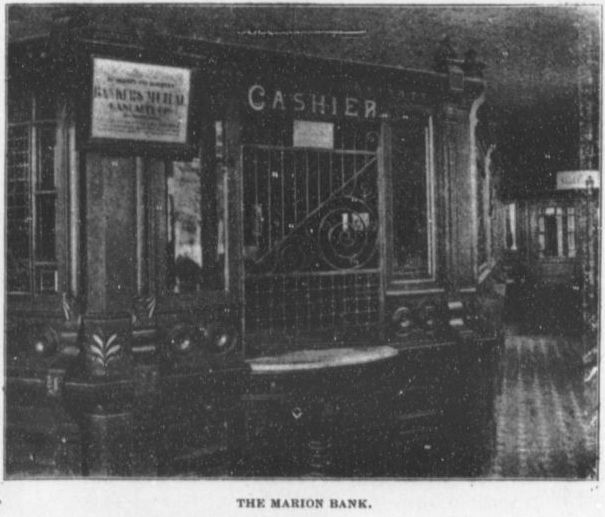 (Marion, Ky.) 1879-1907, July 10, 1902, Image 4 - Chronicling America - The Library of Congress.